Note from shop owner My shop is temporarily closed while I catch up on orders. I check my messages regularly. My shop is temporarily closed while I catch up on orders. I check my messages regularly. Excellent work, helpful and pleasant artist, and good pricing. I'm extremely happy with the glasses, and super happy about the custom snapdragon glass in particular. I would certainly recommend ordering from Brenda, and I would come back to her again. LOVE LOVE LOVE!!!!!! Brenda’s craftsmanship and customer service are amazing! 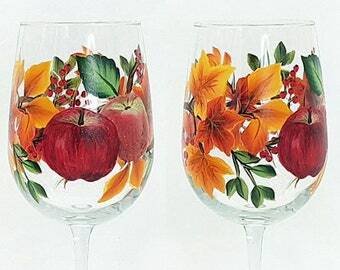 The detail in the flowers, the texture of the paint on the glass, the quick delivery, ALL worth it! A perfect gift for the Apple of your eye! Celebrate Spring with music and your signature flowers. Hand painted sugar skulls just in time for Dia de Los Muertos. 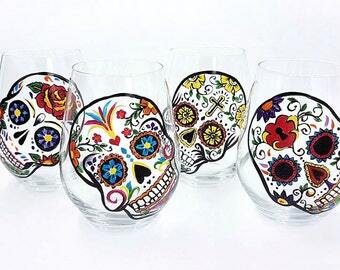 Wine glasses for every occasion. Painting cherry blossoms on a customer's ukulele. Painting cherry blossoms on Christmas ornaments. All pieces are carefully wrapped with a note card and care tags. One of a kind pieces to commemorate life's milestones. Love to scour thrift shops and garage sales for unique and unusual pieces to paint, but I also offer American made glass for your gift order. If you do choose used items, keep in mind that not only are you giving to a cause but you're helping to keep the world green. Ask me about my collection of unique and colorful glassware that's just waiting to be painted! All of my pieces are meticulously hand painted to order with a high level of attention to detail. Painted glassware is heat treated for durability, and should be gently hand washed only with non-abrasive cleaners to keep each piece looking new. Please don't soak or microwave the glass. Each piece or set comes with a tag, care card and thank you card. I'm happy to send a hand written gift card. I believe my specialties as an award winning designer / photo-realist painter show in my work, so when painting glass, ceramics or ukuleles, it's the careful attention to detail that bring my pieces to life. Painting on glass can be tricky, so for me, that involves multiple layers of paint for durability and to help bring out vivid color. And... I've done the research. I never paint any of my drinking glasses up to the rim because every top enamel paint manufacturer and high end art store warns that lips or food / beverages should NOT touch paint even after being cured and even if they claim to be non-toxic. Do not put your glass in the dishwasher even on the top shelf! Dishwashers manufactured today are too strong and will harm the paint. How do I know this? I talk to manufacturers regularly to keep my customers safe and happy. I do not "borrow" copyrighted designs, so all of my work is original. My glasses are all painted by hand - not silk-screened, and I use lead-free glass, so my pieces are completely unique and are safe to use. My first non-commissioned mural at the age of 3 done purely by crayon was a brilliant success until Mom came home from work and took a look at her bedroom wall. My first solo exhibit singling me out amongst my kindergarten peers involving a ship with smokestacks surrounded by air and sea creatures lead to a fit of hysterics (the teacher only tacked my piece to the wall), in which Mom had to leave work to show up and calm me down. My first art contest win at the age of eight at the San Francisco Zoo was I felt well deserved as I'd put a lot of time and thought into my fairy princess drawing (with floating stars). After receiving two scholarships for art, I studied fine art & design in Illinois and my home town of San Francisco. I scored my first job as an illustrator and graphic designer at the age of seventeen. My entire career has revolved around fine and commercial art, from running my own graphic design & illustration business to selling commissioned watercolor portraits, animating video games, designing websites and corporate logos... you name it. When I’m not freelancing, cooking, gardening, sewing, watching scary movies with my husband or singing Hawaiian music & playing ukulele with local bands, you’ll find me downstairs painting something in my new Montreal studio. I love being able to combine many years of graphic design and illustration experience with a strong appreciation for gardening, music, travel and home decor to create original, functional handmade gifts for any occasion. I truly enjoy being able to craft something visually appealing that is also functional. 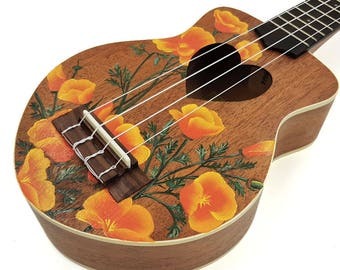 I also love reusing materials that have been previously discarded (old thrift shop vases or abandoned ukuleles) and give them new life. All glass pieces are brand new (unless you've specifically chosen something vintage). I want to make sure that you get exactly what you want and are very happy with the end result. Due to the nature of the hand-painting process, your order may vary slightly from the pictures in the listing. I want you to be happy with anything that you purchase from Lemon Tree Workshop. If you are unhappy with your purchase, you may return the item within 21 days of purchase for a refund or exchange on the item - unless the item(s) has been customized. Items customized with names, dates, or anything specific to an individual are not eligible for a refund or exchange because they cannot be resold. All items are packaged carefully and insured by USPS or FedEx. In the rare case that your item arrives damaged, please contact me as soon as possible and I will handle the insurance claim and send out a replacement order. Please send pictures of your damaged product ASAP so I can put a claim in to the USPS for reimbursement. And please note, UPS requests that you also keep the packaging for inspection purposes. Payment is due at the time of purchase. In the case of non-payment I will cancel the listing. I don't include printed receipts for domestic packages (unless you request otherwise). Your receipt is available online and can be accessed from your own computer whenever you wish. DOMESTIC SHIPPING within USA: I ship orders USPS Priority Mail (2-3 days in transit) unless otherwise arranged. You will be emailed a tracking notice when your order ships so you can track your package online. I ship to the address provided on Etsy unless another address is provided. INTERNATIONAL CUSTOMERS: I recommend that you message me with your desired location so that I can offer shipping options and an exact shipping price. Please be aware that you are responsible for all customs duties, taxes, VAT, brokerage fees, or tariffs levied after the initial US postage. These fees could be applied to your package at the discretion of your local customs officers/post office. I have no way of knowing if my packages will get tagged for fees or how much they will be. Before you order, please make sure you have the correct shipping information. Please allow 3 weeks to finish custom projects unless otherwise noted. Let me know if you have a deadline and I will try my best to accommodate you.